Before welfare people were motivated by an uncomfortable feeling known as hunger! If you were capable of working and chose not to then you went hungry! America could use a little more of this policy for people that can but choose not to work! Luckily, the state of Alabama recognized that the system needs fixing, so they change one thing! Now, it’s time for – no work, no eat! 13 Alabama counties had an 85 decrease in food stamp recipients after work requirements were put in place. This huge percent and proves that changes need to be implemented if we want to stop the finance attack on our country! Via AL.com: “As of Jan. 1, 2017, there were 13,663 able-bodied adults without dependents receiving food stamps statewide. That number dropped to 7,483 by May 1, 2017. Among the 13 counties, there were 5,538 adults ages 18-50 without dependents receiving food stamps as of Jan. 1, 2017. That number dropped to 831 – a decline of about 85 percent – by May 1, 2017. “Based on the trend, the number of (able-bodied adults without dependents) recipients for SNAP benefits is expected to continue to decline statewide and in the formerly 13 exempted counties,” according to Alabama DHR spokesperson John Hardy. Good move! This change needs to be implemented nationally, otherwise, they just move to locations with less stringent welfare requirements. Everyone should earn welfare. You don’t come here, not work and get automatic government support. As President Trump’s job programs grow so will the increase in the need for welfare. We all need to get behind him. If you can work, you should, especially when you are getting assistance! Welfare was implemented for emergency situations, NOT a lifestyle! If it would be used in that manner everywhere, that should help the budget in every state. Sadly, a lot of people abused the welfare system. ← ​This Brave Republican Flipped The Script And Exposed The Sick Truth About Hillary And Russia! 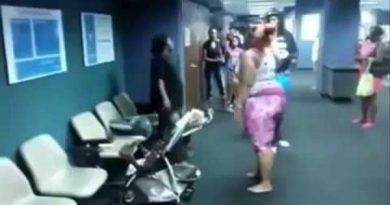 Watch: Lady Goes Crazy When She Finds Out Founds Out Something Interesting About Her Welfare!!! 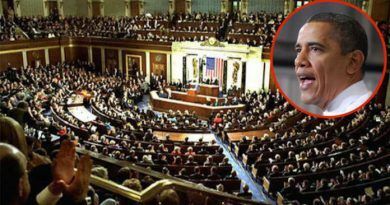 Major Shock Explodes In Congress…Welfare Recipients Panicking!! I’d heard about this happening in GA also, with an 80% reduction. 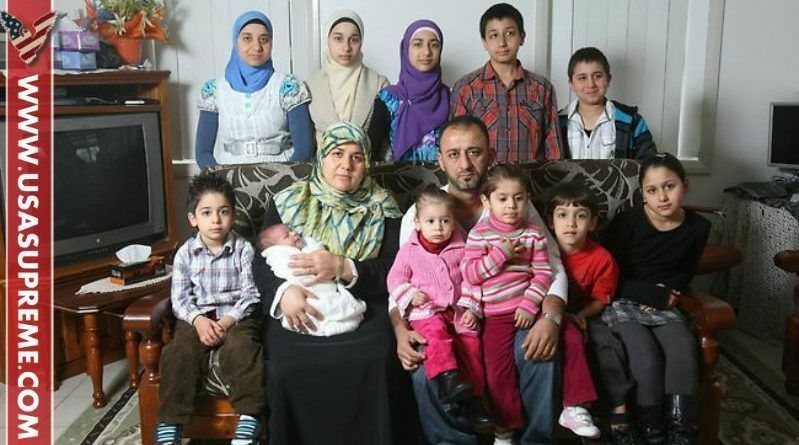 That said, that Muslim family’s photo really ticked me off. That shows exactly the problem with having them in America. They are forbidden by the Quran to assimilate, because their Quran also requires they overthrow all other cultures, the problem is obvious. They are forever a dangerous invasion colonizing. These people need deport back to their own countries, to safe-zones if necessary, but they MUST be made to leave here. Look at the above photo was with this welfare article. They are like spreading vermin, while they live off our tax dollars. That couple has to be in their late forties, if not older, and they are still popping them out. Just consider what their remaining years will bring! This could also just be his first family. Muslims have FOUR wives! and they have continued that here. The gov’t under Obama told them to hide that fact by claiming the other wives as relatives, and yet each still receives a wife’s welfare increased amount! To put this in perspective on why I am angry about this: when I asked my HR why did they vote to allow GMOs in our foods when every other country has not only banned them as too dangerous, but banned any of our foods that contained them from coming into their countries? He said because to have done otherwise would have condemned too many people to starvation. In the USA there are now more people then our natural resources can support. I wanted to scream, then stop bringing in all these millions of refugees and illegal aliens! What he is referring to are wars. Do recall back to every World War where there was forced rationing of food. There would not be enough food in America and people would starve, bringing with it violence and wars on our homeland due to shortages. Thus we would be fighting external and internal wars at the same time. That is not the only risk. Consider the fact of sanctions by other countries. The have the ability to drive us to their will as well, if our population grows to exorbitant numbers. So Congress made a, as they saw it, forced binary choice, allow people to die in a blood conflagration or through a slow hidden poisoning overtime. They chose the latter. Yet like wheels spinning out of control they just keep flooding them in here, because the Communist Anti-American Democrats see them as their voters, their new “Blacks.” Yes, everyone knows Blacks were who kept the Democrats in office, but now the Blacks and even other minorities have begun seeing exactly who the Democrats are, and that the Democrats are actually their oppressors. The Dems cannot allow Blacks to better themselves, as then they have no control over their votes. The Dems are continuing slavery. People cannot bite the hand that feeds them, but when they feed themselves the sky is the limit to making their own decisions about their own lives. So look at that Muslim family and understand this. You do not allow the immigration of one or two individuals and expect them to stay that number. Remember the baby boomer numbers and how that impacted our gov’t expenditure? Well think of the constant and continual explosion of Muslims, who have the most violent culture on Earth, who are instructed by their Quran to live in peace until their numbers are high enough to overthrow the gov’t in the name of Allah, and one that is diametrically opposed to ours. This is just another reason this invasion MUST STOP, and they must be sent back where they came from.. This is a great idea. Too many people just want hand outs and not want to work. This should be done in all states. They also should be tested for drugs. 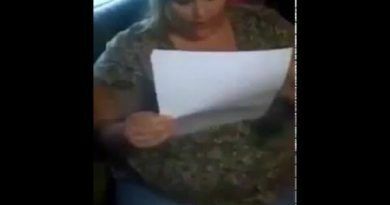 Businesses require drug screening. We don’t need to be handing out money to drug addicts. If people complain the addicts have children then the children need to be taken away. Children don’t need to be exposed to street drugs. Excellent, same should go for food stamps (pan), single mothers. They have one more child to have one more check. They have a man, but do not marry because looses the check, spend money on tatoos, nails, hair colors, get ugly fat, but are young and able to work. I agree with the complete erradication of parasites creation policies like government support programs that encourage the dependancy and promotes laciness.